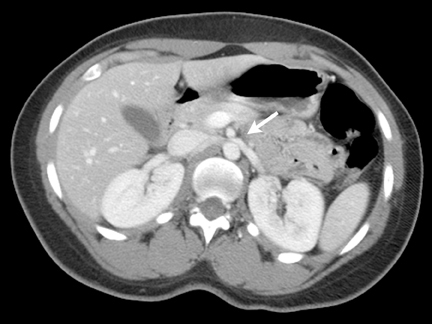 Axial contrast-enhanced CT of the abdomen demonstrated compression of the left renal vein between the superior mesenteric artery (SMA) and the aorta as the left renal vein crosses midline (Figure 1). An axial image of the same patient a few centimeters caudad demonstrated distended collateral vessels secondary to left renal vein compression adjacent to the renal hilum (Figure 2). 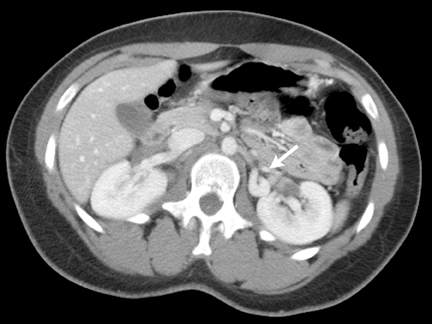 Axial contrast-enhanced CT demonstrated left renal vein in a normal patient (without nutcracker syndrome) as it crosses between the SMA and the abdominal aorta (Figure 3). Nutcracker syndrome refers to the compression of the left renal vein between the aorta and the superior mesenteric artery, which results in elevated left renal vein pressure and possible collateral vein development. 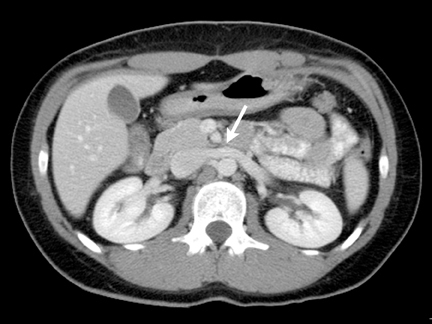 Clinically, Nutcracker syndrome is characterized by intermittent hematuria with or without left flank or abdominal pain. The syndrome occurs in relatively thin patients and adolescents who often have an otherwise healthy medical history.1 The true prevalence of Nutcracker syndrome remains unknown. CT and CT angiography are other noninvasive modalities that can demonstrate compression of the left renal vein in the aortomesenteric angle and collateral veins. However, unlike Doppler sonography, flow characteristic cannot be made in collateral vessels. Magnetic resonance imaging (MRI) and MR angiography may also demonstrate the compression of the left renal vein between the superior mesenteric artery and the aorta. Frequently, intravenous pyelogram and retrograde pyelographic studies are normal. The most common abnormal finding is ureteric or pelvic notching due to extrinsic compression from collateral vessels. Nutcracker syndrome refers to the entrapment of the left renal vein in the mesoaortic angle with elevation of left renal vein pressure. Patients may present with hematuria, proteinuria, collateral vessel formation and pain. The gold standard for diagnosis of renal vein hypertension is renal venography combined with measurement of renocaval pressure gradient, although there is no consensus on criteria for a clear diagnosis. Color Doppler ultrasound, CT, and MRI can be used to help make the diagnosis. Kim S, et al. Nutcracker syndrome: Diagnosis with Doppler US. Radiology. 1996;989:93-97. Takebayashi S, et al. Diagnosis of the nutcracker syndrome with color Doppler sonography: Correlation with flow patterns on retrograde left renal venography. AJR Am J Roentgenol. 1999;72:39-43. Dogra V and Bhatt S. Acute painful scrotum. Radiol Clin N Am. 2004;42:349-363. Umeoka S, et al. Vascular dilatation in the pelvis: Identification with CT and MR imaging. Radiographics. 2004; 24: 193-208. Pan C. Evaluation of gross hematuria. Pediatr Clin N Am. 2006; 53:401-412. Hokama A and Oshiro Y. A thin 43-year-old woman with gross hematuria. Can Med Assoc J. 2005; 173: 251. Rudloff U, et al. Mesoaortic compression of the left renal vein (nutcracker syndrome): Case reports and review of the literature. Ann Vasc Surg. 2006;20:120-129.